With seven games remaining before the Champions Cup qualifiers are decided, Connacht are in a good position - fourth in Conference A with seven wins from 14. In front are leaders Munster, followed by Glasgow, and Ospreys, who are ahead of Connacht by virtue of a superior win count of eight. However, after another frustrating PRO14 fixture at Cardiff Arms Park, Connacht are clinging to that fourth position with the Cardiff Blues now hot on their tail. Connacht's failure to grab the opportunity to win in the Welsh capital - and in the end doing well to salvage a bonus point - left Connacht coach Andy Friend, on his first visit to the venue, unimpressed with his squad. "Not one of our better performances, riddled with error. Everyone knew what was at stake," Friend said. "Yes, we've got some players out, but it provided an opportunity for others to step up, and a lot of blokes missed their chances. "Do we want to be a team that doesn't have players in the Ireland squad so we can keep our squad together? No. We want to keep pushing through, and that is where it was disappointing. Certain players who had opportunities just didn't take them and we will see what happens on selection next time." Both sides were missing a host of players on international duty and through injury, which made for a poor game in what were wet and windy conditions. 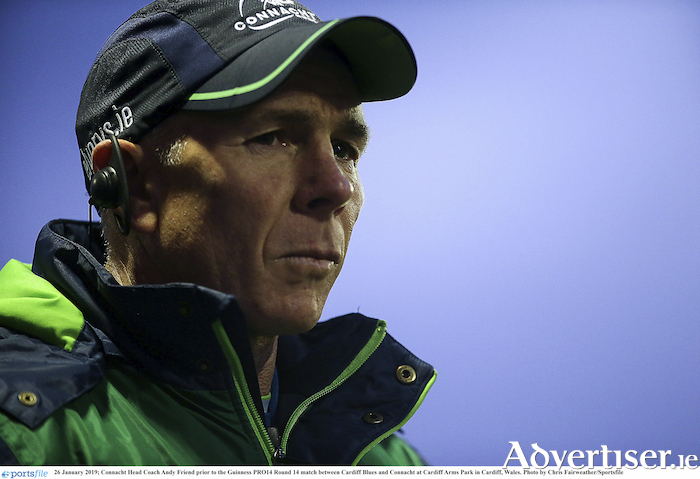 But it was Connacht's failure to convert their chances, control the game, make the right decisions, and adapt to the conditions, which has frustrated Friend. "A game we could have won and should have won," said Friend, "and well done Cardiff, because they were very dogged and physical in their approach to hold us out at the end, but we had ample opportunities to get scores and control the game better, and we didn't." Friend says the one-point defeat will be a marker for his developing squad. "There is a line in the sand on this and we have to decide whether to step over it or stay where we are, and I know this group will step over it. At the end of the season we will look back at a couple of games that have been markers for us, and I reckon this will be another one. "I have no doubt we will turn it into a positive, but we have a bit of work before we get there." With players on international duty, in addition to the injured Kieran Marmion and Sean O'Brien, Connacht still produced enough chances to win, but once again their lack of clinical execution proved costly. Although Cardiff's attacking threat was no better - Connacht's defence keeping them to one score - in the battle of the breakdown the hosts edged this contest. Twenty-one-years-old Cillian Gallagher, making his first start this season alongside James Cannon in the second row due to a training-ground injury to Gavin Thornbury, was one of the youngsters who grabbed the chance to impress, while second-half replacement outhalf Conor Fitzgerald delivered some probing kicks to keep Cardiff at bay. The home side had dominated with the first-half wind advantage, but their scoring opportunities were limited to a penalty from Steve Shingler and a 25th minute Owen Lane try. However, in winning the collisions, they stymied Connacht's attacking threats, despite losing two players to the sin-bin. Connacht briefly wrested control with a succession of four penalties, but failed to break through when, from a five metre scrum, James Mitchell's pass under pressure bounced off Tom Daly's shoulder just shy of the line. With the wind at their backs, it did not get much better in the second half. They did establish territorial control, but their attacking game looked too pedestrian, and their normally reliable maul also stuttered, twice unable to control possession when going forward. They finally made it count in the 75th minute with a forwards' try finished by Paul Boyle, and a Fitzgerald conversion, but it was too late to rescue only a fourth win at the venue since 2001. "We talked about being ruthless, and we were far from ruthless," said Friend. "We were not clinical when we needed to be and we paid a penalty. "It is a shot across our bow, and it's how we come back from it. We had a good block, won seven out of 10 games, and would have liked to have won eight, but we can look at the positives. We are still third in the conference, we are not out of it, but that performance needs to be a line in the sand. We need to step over it or stay where we are, and that is the message we have put to them." Connacht's next game is on February 16 at home to the Cheetahs. Connacht Rugby: T O’Halloran, C Kelleher, K Godwin, T Daly, M Healy, D Horwitz, J Mitchell, D Buckley, D Heffernan, F Bealham, J Cannon, C Gallagher, E McKeon, C Fainga’a, J Butler. Replacements: C Fitzgerald for Horwitz, (44 ), A Lloyd for Mitchell (48 ), T McCartney for Heffernan (50 ), P Boyle for McKeon (60 ), D Robertson McCoy for Bealham (62 ), S Fitzgerald for Healy (62 ), M Burke for Buckley (63 ), J Maksymiw for Cannon (68 ).